Our newly acquired '01 XJ is black and on a warm day we did have the vaporized fuel in the hot rail idle issue. Summer here is brutal so I'm looking for options for scoops or vents on the low budget side. I've seen the spacer / stacked washer approach to raise the rear of the hood and wonder if that's effective. On the next to that cheapest approach are the stick-on cosmetic hood scoops. If they were turned with the opening to the rear and suitably large holes drilled through the hood beneath them, might that work? Can always get another hood from the junkyard. 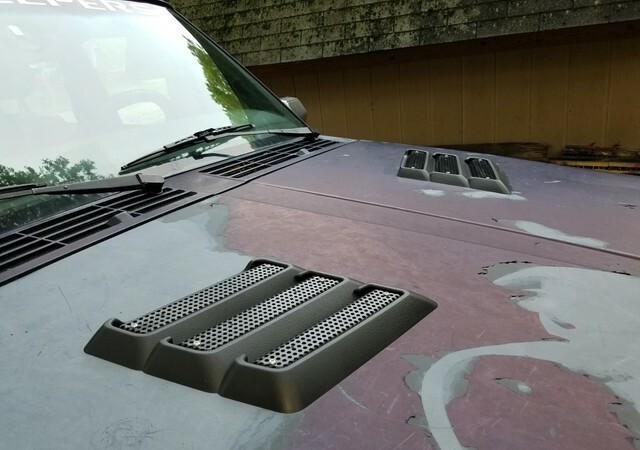 A very popular option that is generally affordable are lebaron hood vents. I live in Az which gets much hotter! Although I've never had any heat soak issues, when building my stroker I went with the DEI rail kit. 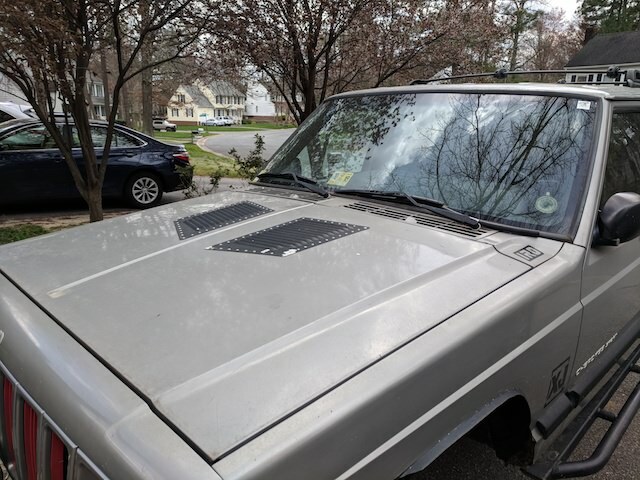 I went with the Lebaron vents on mine. They helped, but I still heat soak if I shut down while running trails. Hood vents, and an e-fan timer for cooling after shutdown. LeBaron and Pontiac Sunbird vents are somewhat common, ZJ 5.9 vents are less common. 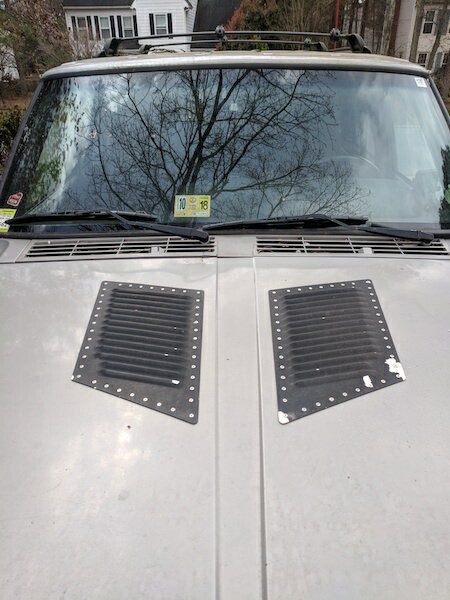 My functional hood vents were donated by a Pontiac Sunbird. Lookup the 1" rear hood spacers. They go on the hinges and raise the rear of the hood almost like a cowl. Independent tests shows a 20* temp drop. Or support one of our sponsors. I use the Napier hood louvers. They work well but anything that allows hot air to escape will reduce heat soak, especially over stock. Thanks for all the responses! Going to the U-pullit yard this weekend looking for vents. If I don't find anything I think the Napier vents will be the choice. I went with Run Cool Hood Louvers. Last edited by XJsportG; April 4th, 2018 at 09:37. I put Napiers on mine. You can see the heat 'waves' coming out of them at stop lights and what not. So they're definitely working. I was snow wheeling last weekend and it was getting a little warm with all the snow moving / high engine load. Hit the electric fan and it almost instantly cooled off (fan helping push heat out the vents). All 2001 US XJs have the dual mini-cats, most 2000s do not, unless California models. There is a big difference between having mini-cats and not having them. 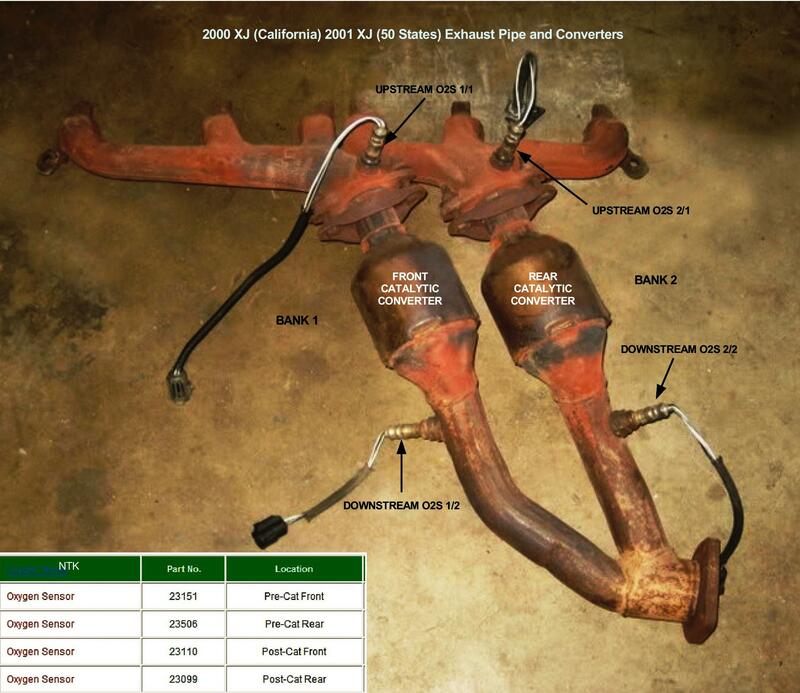 The mini-cats throw a huge amount of heat into the the intake manifold and engine bay. If you have the mini-cats, you most likely will have the heat soak problem in warm weather. It's really a problem when wheeling at slow speeds. It happens when a hot engine is shut off for just a few minutes. Wait twenty minutes or longer and it's not a problem. Over the last 15 years, I have tried all the suggested fixes for this problem. The fuel injectors and fuel pump hold pressure for longer than the Factory specs. The fuel injectors have been wrapped, a TJ manifold heat shield (DEI kit) installed, the bottom of the intake manifold has been insulated, hood vents have been added and a adjustable fan timer installed, for use in warm weather when the engine is shut down. While each added thing has helped some, the only absolute cure has been to use the fan timer, set to run for three minutes, after the engine is shut down. Forcing the mini-cat's heat out with the electric fan prevents the hot soak problem.